We have a new web space! Previously, communications about our major projects have been scattered throughout the blogosphere and various wiki, Lernanta, and WordPress pages. But today we are happy to announce that there is one place you can visit to learn about and get involved with the School of Open, including newbies who just want to find a course to take. Our web address hasn’t changed; it’s still http://schoolofopen.org. We invite any and all feedback at our new discussion space. After wrapping our first round of facilitated courses on copyright, Creative Commons, and Wikipedia earlier this year, we continued to develop courses for independent or group study. Here are the ones we recently launched, including a collaboration with Mozilla’s Webmaker initiative! Developed by Boyoung Chae and co. over at the Washington State Board for Community and Technical Colleges (SBCTC), this course was initially designed to help onboard community college faculty and staff with the CC BY–licensed textbooks coming out of WA’s Open Course Library project. We’ve since worked with them to adapt the course for the general public! This Spanish language course seeks to help librarians and library users strengthen their knowledge of copyright laws in Latin America and the challenges that exist to access to information in the 21st century. CC affiliates from Colombia, El Salvador and Uruguay, in collaboration with the Karisma Foundation, developed this course in response to increasingly restrictive copyright laws in Latin America and around the globe. The course contains examples, analysis and open models based on Latin American cases and legislation. Read more about the course launch here. In collaboration with the OER Research Hub, we’ve been conducting research on the impact of School of Open courses. As part of this project, we invite you to participate in a survey we created for participants of stand-alone courses. Interested in any of the above activities? Get Involved. To receive future updates like this one, sign up for School of Open Announcements. Cat Johnson at Shareable wrote an excellent interview with CC’s Timothy Vollmer on the Open Policy Network, and the importance of open policy in general. Right now this is not the case. In fact, oftentimes the public has to pay for materials several times over before they are granted access to it. Take the example of scholarly publishing. Many university researchers receive grants from the federal government to conduct their work. The public pays for this. The researcher does their work and then publishes in a commercial journal. That journal then sells access back to universities through subscription fees to those publications. I think most people would see that this is not an efficient – or just – use of the public’s investments. I think what’s standing in the way of systemic policy change right now is “business as usual”–incumbent interests want things to stay the same. They want their business models to endure forever, even with massive disruptions of digital information and the web, which have essentially pushed publishing and distribution costs to zero. Read the full interview. And don’t forget, applications for the Institute for Open Leadership are due June 30. Have you gotten your favorite dad a gift for Father’s Day yet? We’ve collected a few of our favorites. There’s bound to be something in this list for every father in your life, no matter whether he’s into classical music or experimental poetry. Those are the two main things dads like, right? If you buy these (or anything) at Amazon and you’re in the US, then consider supporting Creative Commons through AmazonSmile. If you make a purchase between now and Sunday, then CC will receive $5, in addition to our cut of the purchase. “Every translation I’d read felt impenetrable to me with its block after block of nearly uniform lines,” Meyer writes. His translation of the ancient epic is many things – a gorgeous reimagining of how works from an oral tradition can look and behave on paper, an idiosyncratic melding of epic and experimental poetry – but it is stubbornly not block after block of uniform lines. In the year and a half since its publication, the CC co-founder’s book on money in politics has sparked a major, national discussion on how wealthy contributors influence politicians and policies on both sides of the aisle. You could also consider making a donation in Dad’s honor to MAYDAY.US, Larry’s SuperPAC to end all SuperPACs. Add your favorite CC-licensed picks in the comments. Read about this course in Spanish on the CC Uruguay blog. Compatibility with the ShareAlike licenses is now one step closer. After a month-long consultation, we have published our process and criteria for ShareAlike compatibility and are ready to begin evaluating candidate licenses. Licenses named as compatible under this process will be interoperable with the CC ShareAlike licenses, allowing more remixing of ShareAlike-licensed materials with other copyleft materials in the commons. In the new process, CC will evaluate licenses by publishing a preliminary analysis and then holding a public community discussion. Candidate licenses must have a few basic characteristics, including a copyleft mechanism and some way of handling attribution. Additional considerations to take into account include the license’s treatment of Effective Technological Measures, and any additional conditions that the license imposes. It has long been a goal of Creative Commons to make our ShareAlike licenses interoperable with other copyleft licenses. Larry Lessig has been writing about the importance of compatibility to the commons since before 3.0 was published, and a compatibility mechanism was included in 3.0 but never used. We will be looking at the first candidate license in the next few weeks. If you would like to be involved in the discussions, please follow the cc-licenses list. This post with invaluable assistance from the CC legal and policy teams. Text and data mining (TDM) is becoming an increasingly important scientific technique for analyzing large amounts of data. The technique is used to uncover both existing and new insights in unstructured data sets that typically are obtained programmatically from many different sources. A few of the innovative examples include GeoDeepDive, a system that helps geoscientists discover information and knowledge buried in the text, tables, and figures of geology journal articles; improving human curation of chemical-gene-disease networks for the Comparative Toxicogenomics Database; and discovering a new link between genes and osteoporosis. The clarity, however, is far from universal as the situation outside the U.S. gets muddy. While there have been a few welcome developments in the U.K., the copyright laws of many other countries have little to no clarity on whether TDM falls outside of the reach of copyright and related laws. Where TDM does implicate copyright, the license status of the original material can make automated access and analysis very complicated, requiring additional checks to ensure any material is only being used as permitted by the license. And, even where the relevant licenses are free and open, and conducive to TDM, contractual agreements between research institutions and publishers, who are often the gatekeepers of the corpora, can create significant hurdles. Support for text and data mining under the guise of “The right to read is the right to mine” has been demonstrated by other organizations including the declarations by Copyright for Creativity (July 2013) and the International Federation of Library Associations and Organizations (December 2013). If we as a society wish to realize the incredible potential for text and data mining, the practice should not be controlled through contractual terms or licensing. Most recently, the UK copyright reform legislation introduced changes that makes it easier to engage in TDM for non-commercial purposes, allows storing of the corpus locally as long as it remains protected from general public access, and perhaps most importantly, disallows contractual negotiations that would make it difficult to conduct TDM. The above sentiments are laudable, and copyright reforms friendly to TDM are very important, and we support such efforts. However, we believe the more knowledgeable potential users of TDM are about the technology and related issues, the better they will be able to negotiate conditions that make their research easy and efficient. Hence, we want to push forward with education and awareness building as a bottom-up effort. Nurture a community of practice whose members may draw upon each other for continued help. To be clear, we are not intending the workshop to be a detailed and comprehensive training in TDM, and it is certainly not a replacement for expertise in this deep and comprehensive technique. Instead, the workshop is designed to be both an introduction to basic technical and legal concepts as well as an opportunity to get to network with experts as well as novices with interest in the field. We hope participants intending to use TDM for their work will be better informed when seeking collaboration with TDM experts. The first instance of this workshop will be held at the 2014 Open Knowledge Festival. We hope to follow it with one in Nairobi in Aug 2014 at the International Workshop on Open Data for Science and Sustainability in Developing Countries (OpenDataSSDC) organized by the CODATA Task Group on Preservation of and Access to Scientific and Technical Data in Developing Countries (CODATA PASTD), and one possibly at SciDataCon in New Delhi in Nov 2014. We hope to make these workshops a recurring event, building a roster of interesting exercises and problems to solve, and constantly improving the content based on audience feedback and ongoing research. In cooperation with computing, legal and library experts, we will adapt the workshop agenda to make it more suitable and relatable to the host institutions. Our aim is to reach communities of researchers in countries that are otherwise under-represented in the global conversation on open science and data. We have identified researchers, and will continue to identify more, both on the technical as well as legal side with whom we intend to start building a network. If you are working with TDM, intend to work with TDM, and have expertise either in its technology or in related legal issues specific to your jurisdiction, please contact us. We also intend to develop a community of practice for TDM, either standalone or via existing platforms such as StackExchange, and will utilize online resources such as forums, mailing lists, and a roster of technical, legal and institutional experts available to provide assistance with TDM. Stay up to date with CC by subscribing to our newsletter and following us on Twitter. CC is proud to welcome its incoming CEO, Ryan Merkley. We’re excited to announce the launch of the Open Policy Network, a coalition of organizations committed to advancing policies that require open licenses for publicly funded materials. Find out how to get involved. Last week, Lawrence Lessig won a lifetime achievement Webby Award for his work as co-founder of Creative Commons. Have you heard his five-word acceptance speech? The French Ministry of Culture and Communications to embrace Creative Commons licenses. Watch the beautiful new video it made with CC France to explain CC licenses. Who is speaking up for authors who want to see their works disseminated more freely? Enter the Authors Alliance. Australia’s premier public scientific research institute just released over 4000 photos under CC BY. Check out the ScienceImage library. The US White House’s new Open Data Action Plan embraces CC0 for open data. Are there too many video games about zombies? The organizers of the Public Domain Jam think so. Learn about Redactor, a new tool to replace All Rights Reserved images with CC-licensed ones. WindTech TV, a collection of wind turbine technician training materials and simulation modules, is now available under a CC BY license. Developed as part of a National Science Foundation (NSF) Advanced Technological Education project, WindTech TV’s modules are aligned with industry standards and designed to be integrated into two-year college wind technology programs to sustain workforce development in the field of wind power. Modules are currently being used by community colleges across the United States, and Principal Investigator Phil Pilcher wants to expand that impact through reuse by other grantees, including those part of the U.S. Department of Labor’s $2 billion Trade Adjustment Assistance Community College & Career Training (TAACCCT) grant program. All modules are available at http://www.windtechtv.org and videos are available from WindTech TV’s YouTube channel. Earlier this week, we kicked off the Open Policy Network. We announced that the first project within the Network is the Institute for Open Leadership. The Institute for Open Leadership is a training program to develop new leaders in education, science, public policy, and other fields on the values and implementation of openness in licensing, policies, and practices. The Institute is looking for passionate public- and private-sector professionals interested in learning more about openness and wish to develop and implement an open policy in their field. Interested applicants should review the application information and submit an application by June 30, 2014. We plan to invite about 15 fellows to participate in the first round of the Institute for Open Leadership. The in-person portion of the Institute will be held in the San Francisco bay area in January 2015 (TBD: either January 12-16 or January 19-23). Applications are open to individuals anywhere in the world. A central part of the Institute will require fellows to develop and implement a capstone open policy project. The point of this project is for the fellow to transform the concepts learned at the Institute into a practical, actionable, and sustainable initiative within her/his institution. Open policy projects can take a variety of forms depending on the interests of the fellow and the field where the project will be implemented. Questions about the Institute for Open Leadership should be directed to opn@creativecommons.org. Our thanks to the William and Flora Hewlett Foundation and the Open Society Foundations for funds to kickstart the Institute for Open Leadership. In an interview with Publisher’s Weekly, Authors Alliance founder Pamela Samuelson explained that the Authors Alliance will have a few different roles. Inwardly, the group will “provide authors with information about copyrights, licensing agreements, alternative contract terms,” and other practical legal information so that they can make their works widely and openly available. And externally, the Alliance will “represent the interests of authors who want to make their works more widely available in public policy debates,” and advocate for these reforms alongside like-minded public interest organizations. The Authors Alliance was developed by Samuelson and several of her colleagues at the University of California Berkeley including Molly Van Houweling, Carla Hesse, and Thomas Leonard. The Alliance also has an advisory board made up of pre-eminent scholars, writers, and public interest advocates, including several members of the Creative Commons board of directors. The Authors Alliance is now accepting new members. The Alliance has already developed a set of copyright reform principles, outlining its vision for changes to copyright law to support authors who write to be read. We have formed an Authors Alliance to represent authors who create to be read, to be seen, and to be heard. We believe that these authors have not been well served by misguided efforts to strengthen copyright. These efforts have failed to provide meaningful financial returns to most authors, while instead unacceptably compromising the preservation of our own intellectual legacies and our ability to tap our collective cultural heritage. We want to harness the potential of global digital networks to share knowledge and products of the imagination as broadly as possible. We aim to amplify the voices of authors and creators in all media who write and create not only for pay, but above all to make their discoveries, ideas, and creations accessible to the broadest possible audience. Further empower authors to disseminate their works. Improve information flows about copyright ownership. Affirm the vitality of limits on copyright that enable us to do our work and reach our audiences. Ensure that copyright’s remedies and enforcement mechanisms protect our interests. At the core, the Authors Alliance and Creative Commons share a similar goal: to provide useful resources and tools for creators who aren’t being served well by the existing copyright system. We’re excited to work with the Alliance on issues that support authors who write to be read–and the public interest for whom these authors create. If you follow this blog with any regularity, you’re likely already familiar with Bassel Khartabil, the Syrian CC community leader who has been in imprisoned since March 2012 without having had any charges brought against him. Thursday, May 22, is Bassel’s birthday, and the third birthday he’ll be spending in prison. This Saturday, he will have been in prison for 800 days. Post a message for Bassel on Twitter with the hashtags #freebassel and #itsaboutallofus. In particular, people are encouraged to tweet between 13:00 and 16:00 GMT. Submit a photo or message of support to the #freebassel Tumblr. Print one of these beautiful posters by artist Kalie Taylor, or create your own, and distribute it in your community. In late 2013, we blogged about a set of initiatives that French minister of culture and communications Aurélie Filippetti had unveiled. Together, the initiatives represented a commitment to a more creative, more open France. And they also represented a strong commitment to helping students, cultural creators, and society as a whole understand and use Creative Commons licenses, in partnership with CC France. Last week, the ministry announced that it was sharing its two flagships websites under CC BY-SA, culturecommunication.gouv.fr and culture.fr. To help educate French-speaking populations on how to use CC licenses and find CC-licensed works, the Ministry and CC France produced this video. Watch it even if you don’t speak French: the excellent design and flow really speak for themselves. Can it be salvaged to promote public access to federally funded research? In March we wrote about the introduction of the Frontiers in Innovation, Research, Science and Technology Act of 2014 (FIRST Act). The aim of the FIRST Act is to promote the dissemination of publicly funded scientific research. But the contentious Section 303 of the bill rolls back some of the most common policies governing existing research investments. If passed in its current state, the FIRST Act would extend embargoes to federally funded research articles to up to three years after initial publication. This means that commercial publishers would be able to control access to publicly funded research during this time, and the public would not have free public access to this research. Even the longstanding NIH Public Access Policy tolerates embargoes no longer than 12 months. We’ve said before that the public should be granted immediate access to the content of peer-reviewed scholarly publications resulting from federally funded research. Immediate access is the ideal method to optimize the scientific and commercial utility of the information contained in the articles. The FIRST Act would allow grantees to fulfill access requirements by providing a link to a publisher’s site instead of requiring deposit in a federally-approved repository. Currently NIH research grantees must deposit in the PubMed Central repository. The reliance on publishers to make (and keep) the research available jeopardizes the long-term access and preservation of publicly-funded research in the absence of a requirement that those links be permanently preserved. The FIRST Act would permit affected agencies to spend up to 18 additional months to develop plans to comply with the conditions of the law, thus further delaying the plans that are already being organized by federal agencies under the White House Public Access Directive and Omnibus Appropriations Act. The bill was previously was discussed in the subcommittee of the House Committee on Science, Space, and Technology. The passage of the FIRST Act with the Section 303 language as-is would harm existing as well as proposed public access policies in the United States. Today during the full committee markup of the bill Representatives James Sensenbrenner (R-WI) and Zoe Lofgren (D-CA) will introduce an amendment that would improve Section 303. The Sensenbrenner/Lofgren amendment would change the embargo to 12 months, with the possibility that under certain circumstances the embargo could be extended for an additional 6 months. The amendment still does not require that federally-funded research articles be deposited in an approved repository. But it would shorten the length of time agencies get to develop and implement their public access plans. Affected agencies would need to develop a public access plan and report to Congress within 90 days. And the plans would need to be implemented within a year. One interesting piece of the amended Section 303 is that after an initial three-month planning period, the agencies would be required to submit an analysis on whether covered works should be made available under an open license. Such report shall include an examination of whether covered works should include a royalty-free copyright license that is available to the public and that permits the reuse of those research papers, on the condition that attribution is given to the author or authors of the research and any others designated by the copyright owner. There’s still time for you to call members of the House Science, Space and Technology Committee and tell them to support the Sensenbrenner/Lofgren Section 303 amendment. The amendment is a step in the right direction to truly supporting public access to publicly funded research in the United States. I received a fat packet in mail, full of seeds with unusual names—Magma Mustard; Flashy Lightning Lettuce; Lemon Pastel Calendula; Cherry Vanilla Quinoa—and an even more unusual but evocative note stuck on the packets. 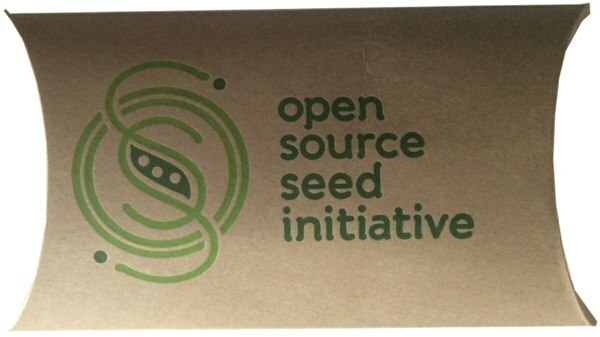 Welcome to the Open Source Seed Initiative, a group that includes scientists, citizens, plant breeders, farmers, seed companies, and gardeners, and has its origins in both the open source software movement and in the realization among plant breeders and social scientists that continued restrictions on seed may hinder our ability to improve our crops and provide access to genetic resources. Jack Kloppenburg, Professor, Department of Community and Environmental Sociology, and one of the founders of OSSI, contacted me a couple of years ago, just around the time I joined CC full-time. He was hoping for a CC-type license for the seeds. CC’s focus, however, is restricted to copyright. And, at least for now, copyright is an area that keeps our hands full. However, OSSI’s goals are very much in line with CC’s mission, to free information, to make it flow from those who create it to those who want to use it, with least impedance. And, what better example of information than a seed in which the very blueprint of life is embedded. Jack’s email signature reads, “Well,” she said, “you have a high tolerance for lunatics, don’t you?” Knowing Jack, that sounds about right. You’ve got to be crazy to be able to change the world. Yes Jack, let’s talk, heck, let’s not just talk, but let’s actually collaborate and spread the seeds of change. Today we’re excited to announce the launch of the Open Policy Network. The Open Policy Network, or OPN for short, is a coalition of organizations and individuals working to support the creation, adoption, and implementation of policies that require that publicly funded resources are openly licensed resources. The website of the Open Policy Network is http://openpolicynetwork.org. Increasingly, governments around the world are sharing huge amounts of publicly funded research, data, and educational materials. The key question is, do the policies governing the procurement and distribution of publicly funded materials ensure the maximum benefits to the citizens those policies are meant to serve? When open licenses are required for publicly funded resources, there is the potential to massively increase access to and reuse of a wide range of materials, from educational content like digital textbooks, to the results of scholarly research, to troves of valuable public sector data. The $2 billion U.S. Department of Labor TAACCCT grant program is an example of a policy whereby publicly funded education and training materials are being made available broadly under an open intellectual property license. There is a pressing need for education, advocacy, and action to see a positive shift in supporting open licensing for publicly funded materials. The Open Policy Network will share information amongst its members, recruit new advocates, and engage with policymakers worldwide. The OPN members are diverse in content area expertise and geographic location. Creative Commons is a part of the Open Policy Network because we believe that the public deserves free access and legal reuse to the the resources it funds. With simple policy changes — such as requiring publicly-funded works be openly licensed and properly marked with easy-to-understand licensing information — the public will be better able to take advantage of their rights to access and reuse the digital materials developed with taxpayer funds. With today’s launch of the Open Policy Network, we’re announcing our first project, the Institute for Open Leadership. Through a weeklong summit with experts, accepted fellows will get hands-on guidance to develop a capstone project for implementation in their organization or institution. The Institute for Open Leadership will help train new leaders in education, science, and public policy fields on the values and implementation of openness in licensing, policies, and practices. The Open Policy Network is free to join and anyone is welcome! More information on the Open Policy Network is available at the website, Google Group, Twitter, and Facebook. Attention game designers: Public Domain Jam! If you’re a videogame designer and you have nothing to do over the next week (or if making cool games is more fun than your day job), why not spend the week developing a public domain game? The idea of The Public Domain Jam is to encourage developers to create games based on public domain assets and stories, and optionally give the games themselves back to the public domain via the CC0 waiver. The game trailer encourages designers to think about the amazing wealth of public domain source material: maybe in the next week, Ovid’s Metamorphoses will dethrone zombies as the most important source of game design inspiration in the public domain. The contest is being organized by game developer Gritfish, and fellow game developer Nick Liow is sponsoring a $1000 prize for the best CC0 game. If you recognize Nick’s name, it might be because I interviewed him last year about his Open Game Art Bundle. Since then, he’s released his own crowdfunded CC0 game, Nothing to Hide. Hurry! The Public Domain Jam ends May 24. I’m honored to be chosen as CEO of Creative Commons. CC is a giant of the open web, and it’s an organization that I have always believed in and truly admire. I appreciate the confidence shown by the board, and support I have already received from staff and community members has been fantastic. My path to CC has been unorthodox, but feels logical in retrospect. My commitment to public service and the public good; my deep belief in the power of technology; and my work to support the open Web as a place for everyone to create, share, and connect. Those are common threads that run through my work at the City of Toronto, at Mozilla, and now with Creative Commons. Why am I joining CC? Because its success is so vital, and I want to ensure we succeed. Creativity, knowledge, and innovation need a public commons — a collection of works that are free to use, re-use, and build upon — the shared resources of our society. The restrictions we place on copyright, like fair use and the public domain, are an acknowledgement that all creativity and knowledge owe something to what came before. Without a robust and constantly growing collection of works available for use and reuse, we lose the kind of innovation and creative inspiration that gave us Disney classics, hip-hop, and the interoperable Web. The consequences of failing to grow and protect the public commons present themselves as lost opportunities: discoveries not made, innovations left undeveloped, and creativity unrealized. It’s complex and hard to quantify, but also dangerous to ignore. A public commons is a driving force to advance human knowledge, and is essential infrastructure for the global economy. In today’s legal environment, the commons is increasingly under threat. New works are restricted by copyright from the moment they are created until long after their creators are dead, and stricter copyright rules are almost always demanded by large rights-holders who benefited from the commons in the first place. It’s like running across a rope bridge only to cut it loose once you get to the other side. And today’s battles over copyright often ignore the fact that the Web has dramatically shifted the motivations for creators: it’s no longer only about money. Many do it just for the love of their craft, or just to be seen in the world, and still more are finding ways to share their work and get paid at the same time. There needs to be a balance that allows business models to thrive, and allows shared work to proliferate. In the modern copyright environment, each one of us has to make a conscious decision to share our work. It can be complicated, confusing, and expensive. But we need creators to be inspired to do it anyway. We need governments, nonprofits, and institutions to give the public permission to use their works. We need an organization that makes the case, creates solutions so that sharing is easy even when the legal frameworks make it difficult, and that champions the benefits — both to individual creators, and to society. That’s where Creative Commons has to lead. A lot has changed since the first Creative Commons licenses were released in 2002. While the organization has been by many measures incredibly successful — enabling hundreds of millions of works to become part of a public commons — it has also struggled to adapt to new technology and the massive expansion of content created online. Half a billion licensed works is an impressive achievement, but today’s Facebook users upload 350 million photos a day, and YouTube users upload over 100 hours of video a minute (yes, some of it CC-licensed). I want to drive more licensed works into the commons by breaking down the barriers — legal and technical — for individual creators. And we need tools to help those who would reuse their work to find it quickly and easily. In his 2008 book, The Public Domain: Enclosing the Commons of the Mind, James Boyle (also a former CC board member) makes an impassioned plea to build a global movement that will fight for the public commons — one modeled after the environment movement, which took something complex and hard to quantify and drew people to its cause. I believe Creative Commons must lead this movement. We need to rally people to our cause, and ask for their creativity, their time, and their financial support. We begin with a global network of 70 affiliates around the world who already form a vibrant, opinionated, and brilliant community of legal experts and advocates. The seeds of our movement already have roots. We have a strong suite of free licenses that enable sharing in an increasingly restrictive legal framework. And we have a powerful, recognizable brand that is respected the world over. Not a bad place to start. I’m excited to step into this role, to defend and champion the public commons, and to join this global community and movement. I am thrilled to welcome Ryan Merkley as the incoming CEO of Creative Commons. This is an important moment in the history of the organization. After eleven years, CC licenses are globally recognized as the definitive tool for sharing creative works. Millions across the world use CC as a force for good in their communities. We are building universal access to knowledge and culture as we had hoped — within the freedoms we craft inside copyright. But the web has changed, and its users with it. And CC must too. I am excited and incredibly pleased that Ryan has agreed to join CC as the leader to take CC into its next era. Ryan is an outstanding and recognized voice among Mozilla’s global community. From his time there he has proven that he is a strong believer in the open web, open data, and open content, and he knows how to activate and motivate community members for change. He is a leader with a great technical vision informed by the right values. He has inspired all of us, and I am confident he will be the leader CC needs. At the last Creative Commons Global Summit in Buenos Aires, someone asked me how I’d like to see the organization change. My answer was simple: We celebrate the tremendous achievement of Version 4.0 of our Creative Commons licenses. But we are still at Version 2.0 of the technology that we use to deliver those licenses. Ryan will fix that, and give CC another decade of incredible growth and remarkable success. We are grateful he has agreed to share his enormous talents with us.